Project Performance Analysis is the process of comparing the actual project execution against the Performance Measurement Baseline. The analysis provides the project team with an understanding of the project and its progress. It will help identify possible risks, and opportunities, so proactive project decisions can be made by the project manager. There are a couple of currently approved processes in use. One is referred to as Earned Value Method, and it is used to compare costs / units with the PMB. The other is the Earned Schedule method, and it compares essentially earned time with the PMB. There are three basic sets of indicators in an Earned Value Management System. It is through these metrics that a project’s current schedule and cost status can be established and a final completion date and cost for the project can be estimated. Data for these indicators are normally measured in dollars ($). Actual Cost or Actual cost of Work Performed (ACWP) is provided by the Project LEMS, invoices, etc. Once these values are calculated, a variance analysis can be completed. Variance analysis quantifies the deviations from the performance measurement baseline (PMB) to the current reporting date. Internally there are two calculations used, one for cost variance and one for schedule variance. 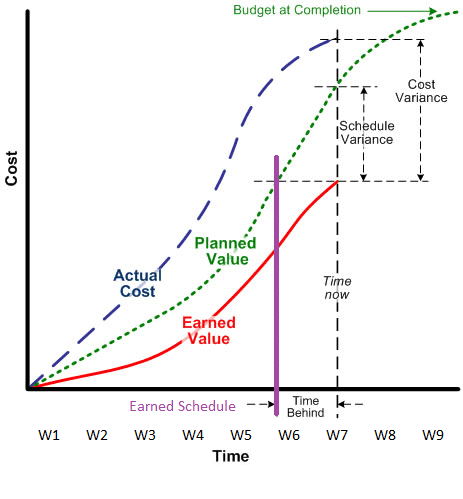 Schedule variance (SV) is the difference between Earned Value and Planned Value. If the result is zero (0) the project is on schedule. If the result is a positive (+) value, the project is ahead of schedule. If the result is negative (-) value, the project is behind schedule. Cost Variance (CV) is the difference between the Earned Value and the Actual Cost or incurred + accrued value. If the result is zero (0) the project is on budget. If the result is a positive (+) value, the project is under budget. If the result is negative (-) value, the project is over budget. Schedule Performance Index (SPI): The ratio of Earned Value over the Planned Value. If the result is equal to 1.0, the project is on schedule. If the result is greater than 1.0 the project is ahead of schedule. If the result is less than 1.0 the project is behind schedule. Note: The SPI will always trend to the number one as the project progresses. Cost Performance Index (CPI): The ratio of Earned Value over actual or expended Value. If the result is equal to 1.0 the project is on budget. If the result is greater than 1.0 the project is running under budget. If the result is less than 1.0 the project is running over budget. The above values need to be calculated every reporting period, stored and tracked so that they can be plotted and trended as the project is executing. Below is a sample S-Curve of a project. Looking at these curves, one can see that this project is over budget, and behind schedule, and trending worse.